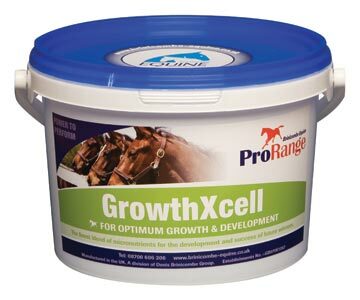 Brinicombe Equine GrowthXcell provides a well balanced, high specification diet which encourages an optimum growth rate and sound conformation during the developing stages. By providing extra support you are giving youngstock the best start in life that helps to ensure they develop into strong and athletic performance horses. GrowthXcell has been formulated with an optimal blend of phosphorus, calcium and vitamin D3 for bone support, while glucosamine and MSM have been added to provide development of healthy joints. Essential vitamins, amino acids, and bio-available trace elements have also been added to support muscle development and growth. GrowthXcell can be fed to broodmares during pregnancy and is highly recommended for all youngstock from weanlings to three years. All breeding stock, including youngstock and broodmares. Calcium carbonate, mono-sodium phosphate, sodium chloride , magnesium phosphate, linseed oil, methyl sulphonyl methane, potassium amino acid chelate, magnesium amino acid chelate. Phosphorus 6.00%, Calcium 11.20%, Sodium 8.31%. There is no initial loading rate with this product. There are currently no questions for Brinicombe Equine GrowthXcell for Horses - be the first to ask one!